Updated: There Will Be No 'Special Announcement' From Tiger Woods Today : The Two-Way Many media outlets — except the one on which he's supposed to be appearing — are saying that golfer Tiger Woods will be making a "special announcement" of some kind on The Golf Channel at 11 a.m. ET. It turns out it will be his agent who will be interviewed. After a confusing few hours this morning in which many media outlets were reporting that Tiger Woods would make a "special announcement," The Golf Channel says the network is interviewing Mark Steinberg, Woods' agent. Golfchannel.com is reporting that Woods will not be on the network and that Steinberg is talking about himself and his future after leaving International Management Group in May. 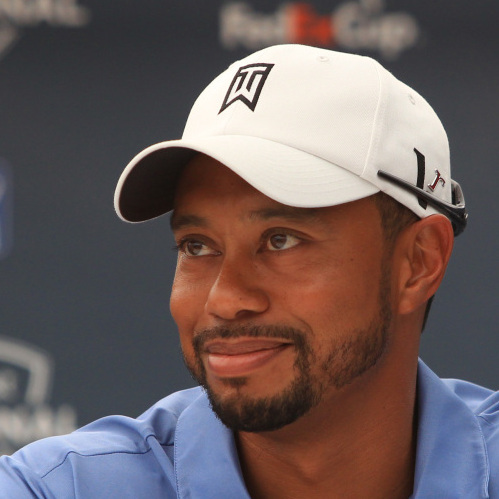 June 28, 2011, file photo: Tiger Woods. Update at 11:40 a.m. ET. The 'Special Announcement'? It seems the "special announcement," or the only piece of news to come out of this, is that Woods and Steinberg are moving from International Management Group to Excel Sports Management, according to a press release from Excel Sports, which also represents Derek Jeter. Many media outlets — except the one on which he's supposed to be appearing — are saying that golfer Tiger Woods will be making a "special announcement" of some kind on The Golf Channel at 11 a.m. ET. We called The Golf Channel's headquarters in Orlando and all we could get out of them was "stay tuned to see." No confirmation, even, of whether Woods will be on. Meanwhile, CNN says that Woods' agent swears there's no "announcement" coming. Supposedly, Woods will talk with the network's Kelly Tilghman, who has interviewed him before. The secrecy surrounding this supposed surprise has opened the door to speculation, of course. At NBC Sports' ProGolfTalk blog, they're tossing out possibilities ranging from "he's done for 2011" (which seems very possible) to "he's going to retire" (far-fetched, we think). He's now 35-years-old and has won 14 "major" tournaments — but none since the 2008 U.S. Open. That was a year before the Thanksgiving 2009 evening when Woods' life exploded on to the tabloids and cable news channels as his extramarital affairs became known. We'll watch to see what, if any, surprise Woods has.